For several years now, I’ve been reading and hearing news reports on how the use of 3-D printers is bound to change the world as we know it. 3-D printing is not only changing manufacturing, but it’s also changing and speeding up the innovation process. Here’s a link to a heart-warming story I heard on NPR just last week: With 3-D Printing, Affordable Prosthetics Are In Reach. It’s stories like this one that caused me to jump at the chance to tour the Fab Lab, or digital fabrication laboratory, in uptown Martinsville, Virginia last week. The original Fab Lab idea was the brainchild of professor and director of MIT‘s Center for Bits and Atoms, Neil Gershenfeld. Watch his 2006 Ted talk, “Unleash Your Creativity in a Fab Lab,” here. 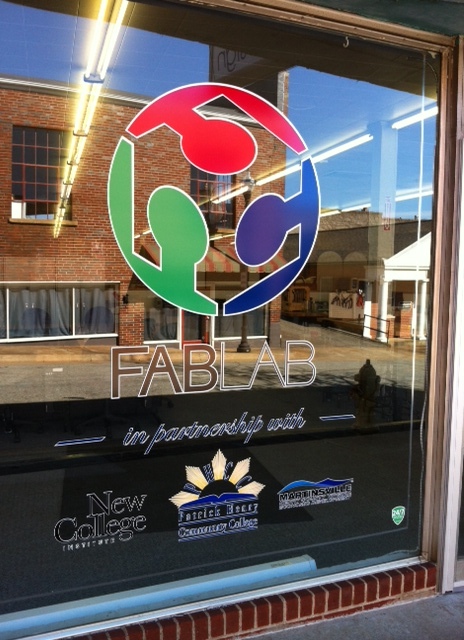 Opened last summer, the Fab Lab in Martinsville is a collaborative project of Patrick Henry Community College, New College Institute and the Martinsville – Henry County Economic Development Corporation. Located in the Southern Virginia Artisan Center, the Fab Lab provides training and equipment to students, businesses and entrepreneurs. My tour guide was Fab Lab Coordinator and Instructor, Matthew Wade. “To qualify as a true Fab Lab,” Matthew explained, “the facility has to be accessible to the public.” According to the MIT charter, a Fab Lab has to be open to the public for free or in-kind/barter at least part of the time each week. Read more about who/what qualifies as a Fab Lab here. Most impressively, Matthew assembled the Fab Lab himself. He installed 10 Dell workstations surrounded by whiteboards. Other hardware includes a mid-range 3-D printer, laser engraver, vinyl cutter, CNC plasma cutter, mini-mill, vacuum former, injection molder and welder. 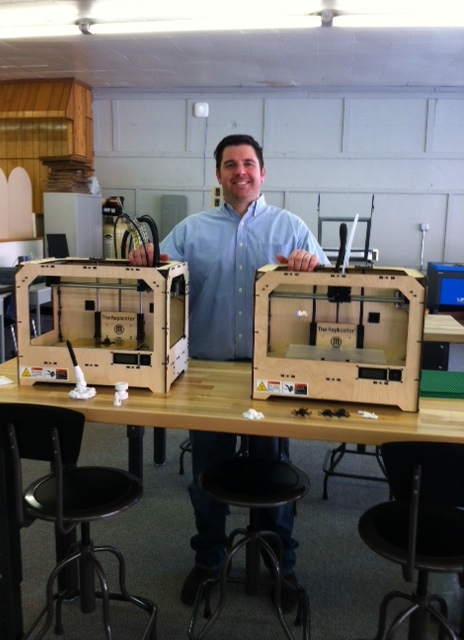 Matthew is particularly proud of the two additional MakerBot 3-D printers that were donated to his Fab Lab. As fascinating as the physical tour was, I was especially inspired by the ideas and attitudes of both Matthew and colleague, Katie Croft, Coordinator of Experiential Learning at the New College Foundation. Along with many others, they are working in a myriad of ways to create opportunities for area students to thrive and get hired after graduation. 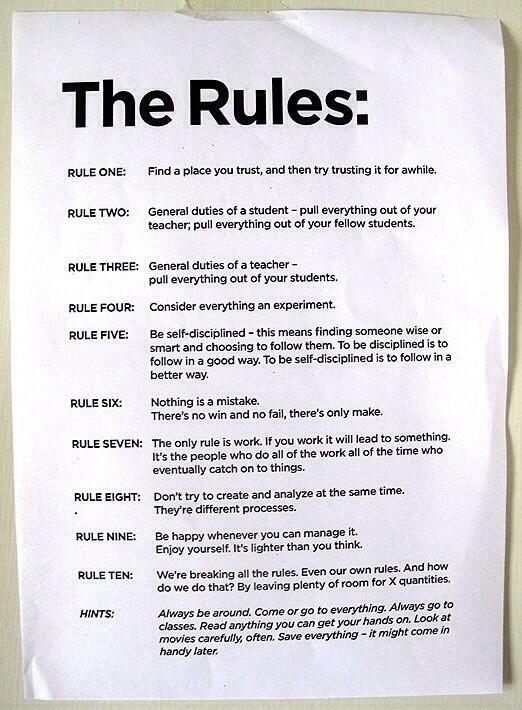 I chanced upon “The Rules” again yesterday. They’re the ones attributed to John Cage, one of the most influential American composers and pedagogues of the 20th century. Many of his works disrupted the way we think about listening. To Cage, music was everywhere and could be made with anything. Chance plays a big role in many of his works. His RULE TWO and RULE THREE can just as easily apply to the workplace, as to the classroom. Each of us should pull everything out of our leaders and of our colleagues – and vice versa. RULE FOUR, RULE SIX and RULE TEN come straight out of any course or book on Design Thinking today. I know it’s an understatement, but Cage was way ahead of his time. RULE SEVEN is an excellent reminder. We still need to put in the hours, i.e., practice, to become accomplished at anything. RULE EIGHT is another good reminder, as we probably all fall prey to editing our ideas before we’ve even given them a chance to develop. RULE NINE is an important one. If we can enjoy ourselves, our work will be that much better. His HINTS are pretty important, too. I think Cage is reminding us to practice empathy by getting out in the world. He’s urging us to stay curious and gather our dots for connecting later.